If you’re a brand, you want eyes on your product or service–and more importantly, you want people to come back. 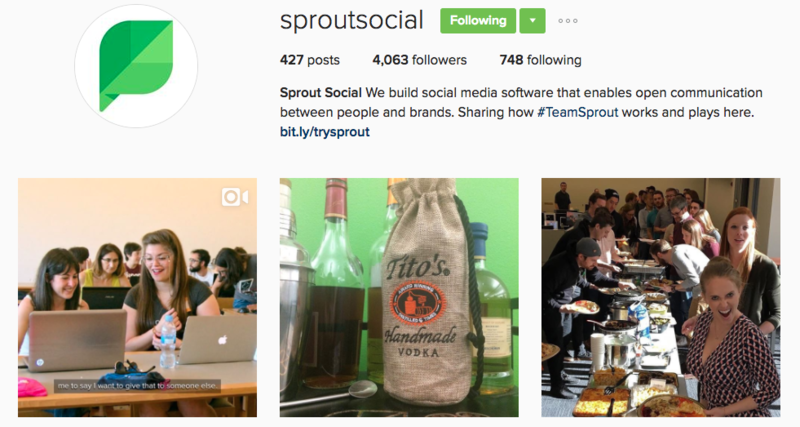 To stand out in the crowd, your brand might’ve adopted Instagram. However, does your audience consider you one of their favorite Instagram accounts to follow? Being a network based on visual entertainment creates endless possibilities to showcase your brand, company voice or design talent. Here at Sprout Social, we take pride in our design and visual aesthetic, which we transcribe into our social media analytics and reporting features. 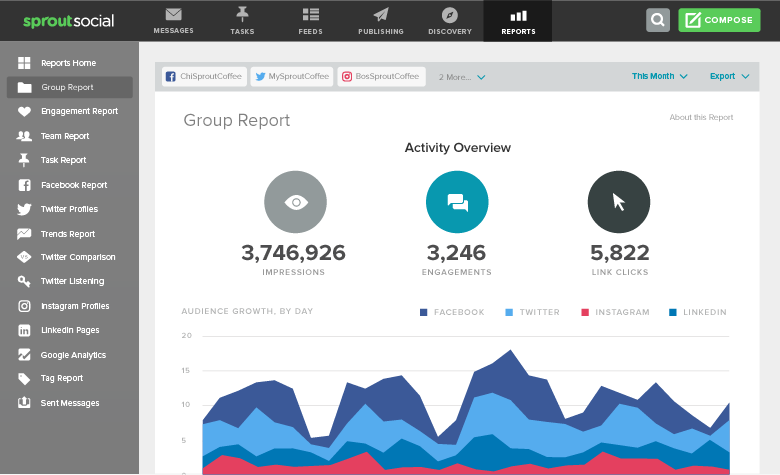 Having visually appealing tools and reporting can make social media management simply more manageable. But as many designers and social media managers will tell you, they get a lot of inspiration from the people and brands doing it right on platforms like Instagram. Your social presence means a lot to people. According to the Sprout Social Q3 2016 Index, 57% of consumers said they’re more likely to buy from brands they follow on social. So how do you keep people coming back to your networks? To truly be successful, you need to make a strategy around creative, simplistic and engaging content. Luckily, there are several brands out there who can give the rest of us inspiration on visuals, post types, colors and themes. You won’t find many major brands in this list. Most of them are already well known or have such large creative teams it’s impossible to look bad on Instagram. 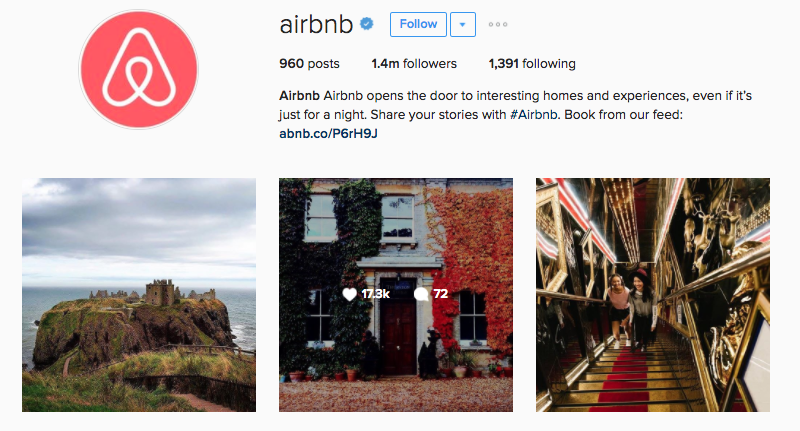 However, one giant that catches eyes with beautiful Instagram content is AirBnb. Whether you’re looking for a place to stay on vacation or at home off the beaten path, AirBnb has you covered. This idea is apparent in AirBnb’s Instagram account, which highlights some of the most unique lodging sites across the world. Additionally, the brand pushes an endearing humanistic element that coincides with AirBnb’s philosophy of meeting interesting new people and staying in homes you’d never experience with a major hotel. 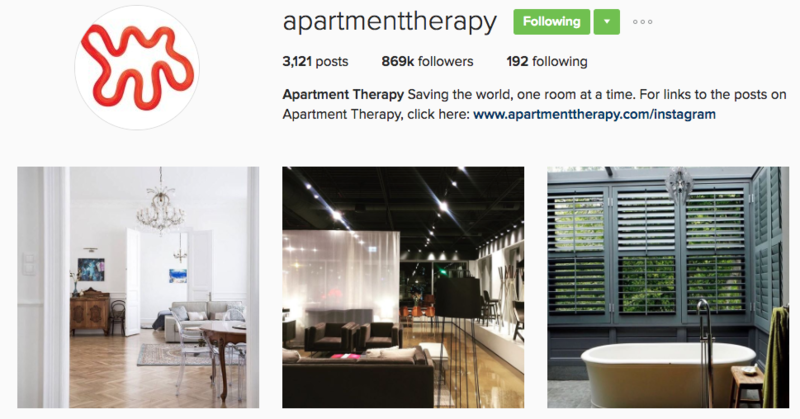 The Instagram account makes you feel like you’re in the customer’s shoes, which is very deliberate. In fact, if you see an AirBnb photo you like, the company provides a link to all the locations where the content form. This gives you the opportunity to experience exactly what the Instagram photo brings to life. 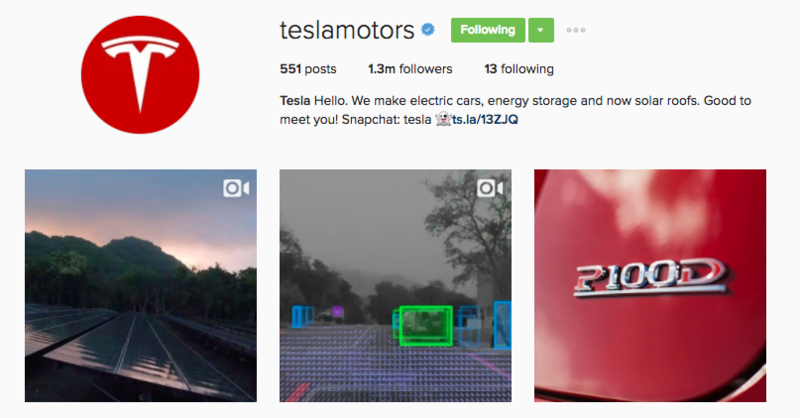 Another major company that stands out on Instagram is the electric auto manufacturer Tesla. While their Instagram account is product heavy, the company does a great job at highlighting the smallest details about their cars. For those in the industry, they’ll likely tell you the smallest things count when it comes to choosing one car over another. The account isn’t short of great photography and always gives something visually appealing for users to come back to. The Adobe Suite of tools is known by various creative types and their Instagram appeals well to exactly those people. Actually, one of the best features of this account is it’s all user-generated content. Users send Adobe content made with their tools to highlight the amazing things you can do. For creative designers, photographers, illustrators and other artists, the Adobe Instagram space is a source of inspiration. The company successfully showcases how you can use their product to produce better work all while inspiring users who engage with the content each day. 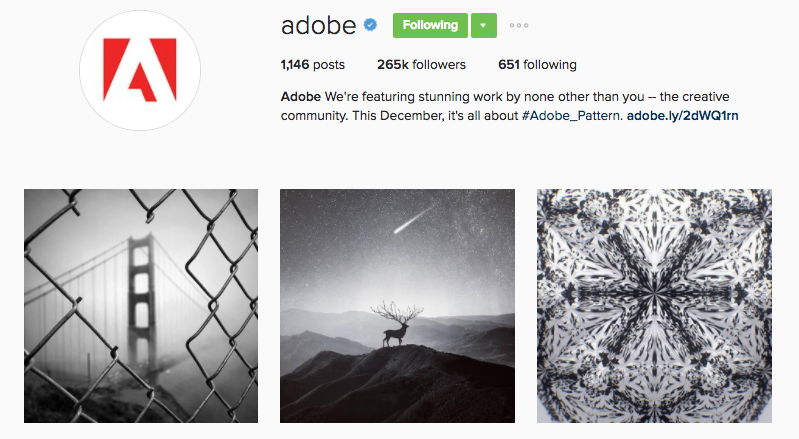 For brands looking to employ a UGC strategy focusing on product use, look to Adobe’s Instagram. Even though the branding giant Nike has plenty of appeal on its main Instagram account, the subsidiary Nike Lab is even better. In fact, the company uses multiple Instagram accounts successfully with more than 20 pages tied to a specific niche. What sets Nike Lab apart is simply that–this account stands out among the rest. The account explains in detail about its products giving you everything you need to know about an upcoming release. The Instagram page goes all-out with how their products can perform, whether it’s comfort, longevity or adaptability against different weather conditions. 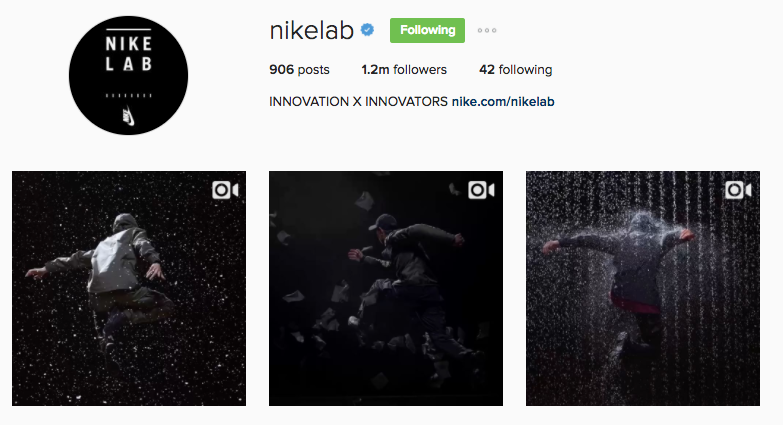 For brands looking to get inspired on setting up a new and unique Instagram account outside of the main brand, Nike Lab is a good place to start. Reuters photography is a staple source for worldly news images showcasing current events, pop culture and trends across the globe. The company provides links to photos surveying the world and picks its best for Instagram. While the company doesn’t promote its services, it does highlight its creative viewpoint and excellence in photography. 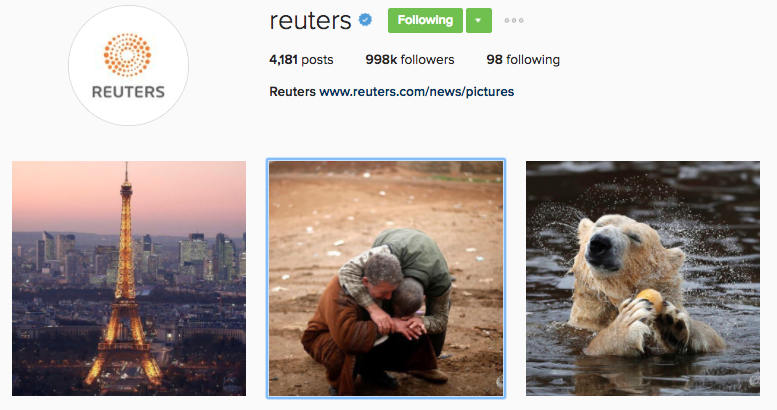 Reuters works well as your main photographic news source by providing spectacular images. While some brands might think it’s too expensive to run multiple accounts or hire a world-class design team, there are alternatives. 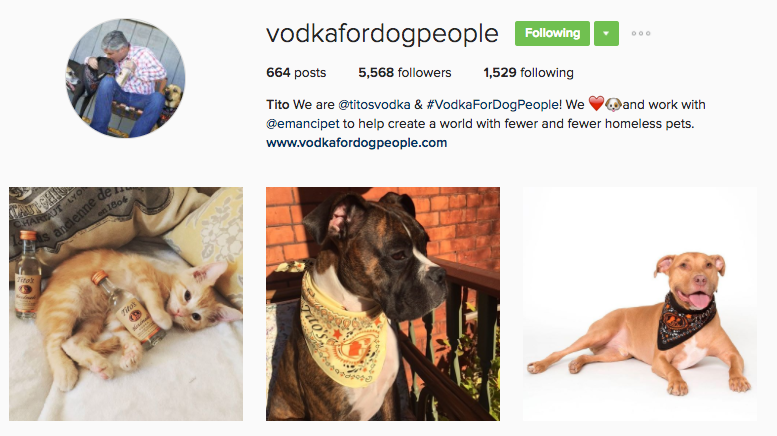 Tito’s Handmade Vodka does an amazing job at highlighting another brand statement besides good vodka–ending homelessness for pets. Vodka for Dog People highlights for adoption or previously adopted dogs (and the occasional cat) from brand loyalists of Tito’s. The company shows its humanistic side by creating awareness for pet adoption while promoting its brand ambassadors. There’s not a lot of fancy production here. Instead, Tito’s uses a great idea to promote what they love most–vodka and dogs. 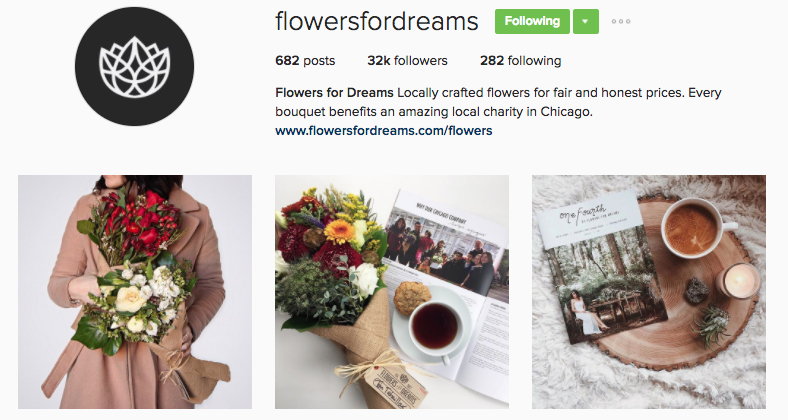 Flowers for Dreams is a locally-owned florist in Chicago that donates to neighboring charities for every bouquet sold. While they might not be the size of 1-800 Flowers, the company succeeds at promoting local with beautiful images. With more than 32,000 followers, each post earns hundreds of likes. Not only that, but Flowers for Dreams engages regularly with its followers to promote the different charities and products available. This company has its branding strategy figured out, which could help other companies learn a thing or two about simple marketing. Doing this can really drive engagement on your business’s Instagram front. Scour this page and learn some great tips! Do you remember how much fun you had with Playdoh as a child? Well their social media marketers sure do because each post shows a creative and fun way to use their products. The company uses a lot of stop-animation content–showing everything you can do with Playdoh. They show you why it’s one of the best Instagram accounts to follow with amazingly crafted objects, animals and shapes. 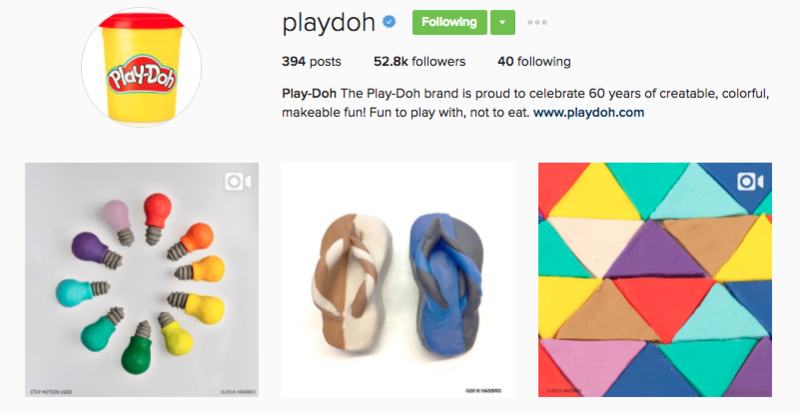 Playdoh successfully targets their user-base and highlights events like back-to-school shopping and popular hashtag holidays like national Best Friend Day. The brand is known for its bright colors and their Instagram follows suit. Charity Water showcases its service in action–bringing clean, drinkable water to places in need. 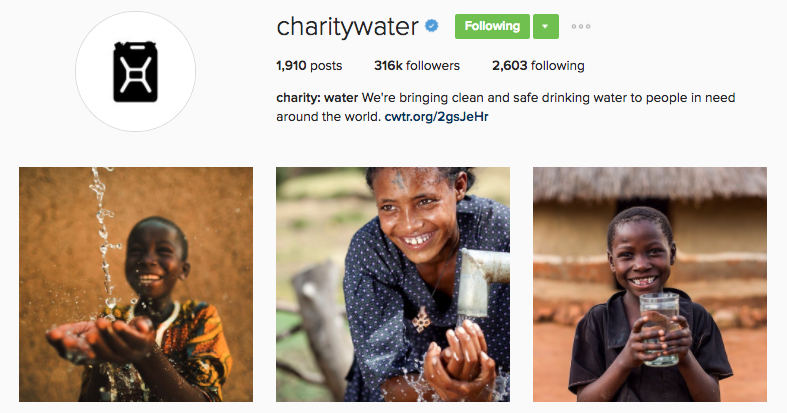 Brands can take notes from Charity Water’s Instagram because of the captions that attribute so well to the content. The organization highlights its success stories and shows the people who are affected by the contributions. Not only is Charity Water’s content inspiring, but their feed does a great job at drawing interest. This helps keep users around and spread the word about their brand. Take a look at this post for creative Instagram caption ideas. 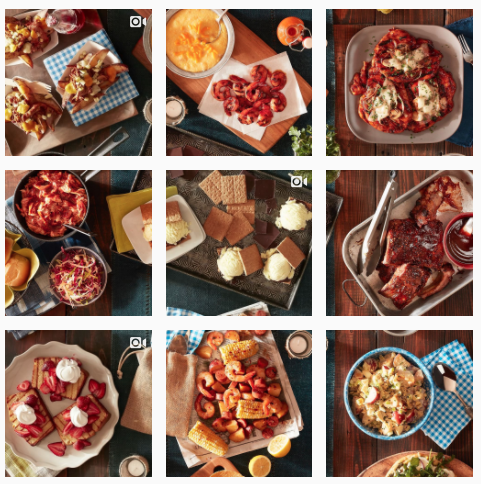 As a popular chef with awarding-winning restaurants in New York, David Chang brings a little spice to his Instagram account. Often pairing slow-motion video with music, his Instagram is immediately entertaining for foodies and chefs around the world. 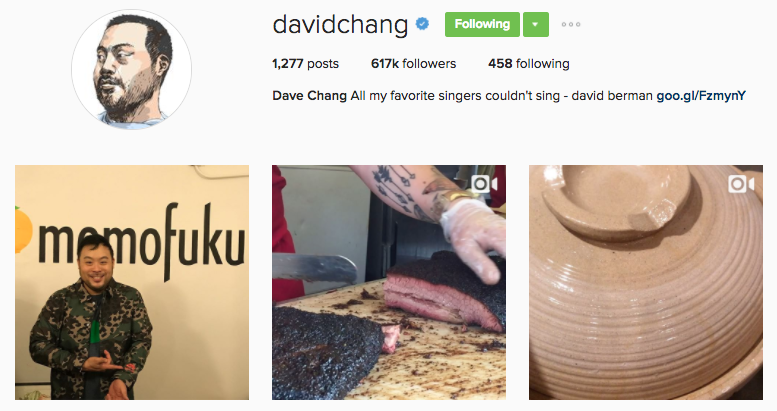 Brands can learn a lot from influencers who have major followings and Chang is no exception. Most of the content is made from his own smartphone, but you’ll never have a dull moment following Chang. He has certainly mastered the art of making you hungry through his slow-mo videos. This beauty-product specialist makes its statement known within it’s Instagram bio–”skin first, makeup second.” Glossier does amazing work at showcasing this motto by providing bright, vibrant and pink images to highlight the importance of skin care. 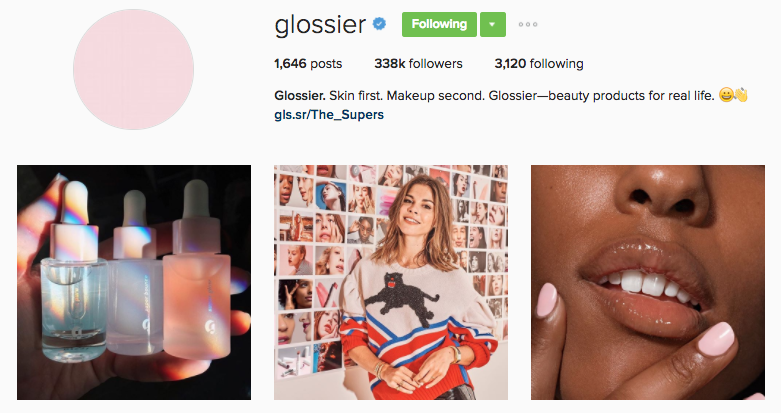 With already exceptional branding, Glossier takes their talents to Instagram with engaging images of their products or of them in use. The company will even post its occasional meme to steer clear of only using promotional material in its feed. Their humanistic, down-to-earth marketing approach works well on Instagram. And it often feels like you’re following a friend instead of a brand. Who knew aluminum foil and plastic wrap could be so creative? 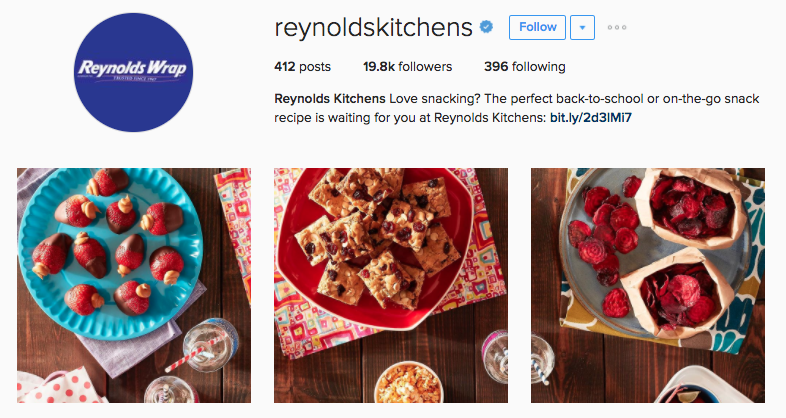 Reynold’s Kitchens has an absolutely beautiful Instagram feed showcasing its never-ending table. Each image showcases a different product that could be used on your own kitchen table. In profile view, the table is endless with dishes, baked goods and meals. The collaged images are perfect for Reynold’s brand without going overboard. This company simply shows you how a simple idea can turn out to be great marketing. The motorcycle helmet and accessory manufacturer provides stunning user-generated content along with marketing images to showcase its products and the lifestyle associated with the brand. Many of the images are scenic landscapes from motorcyclists on the go. 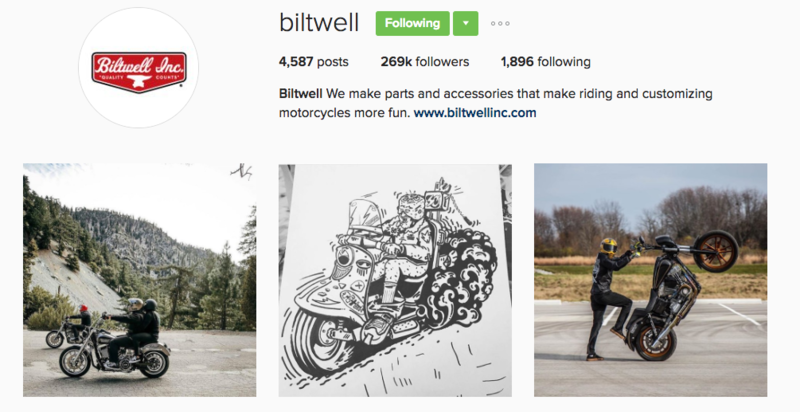 Selling helmets, footpegs and satuals gives Bitwell the ability to market the lifestyle that comes with the product. This account shows marketers it’s not all about the product, but where you could use it. 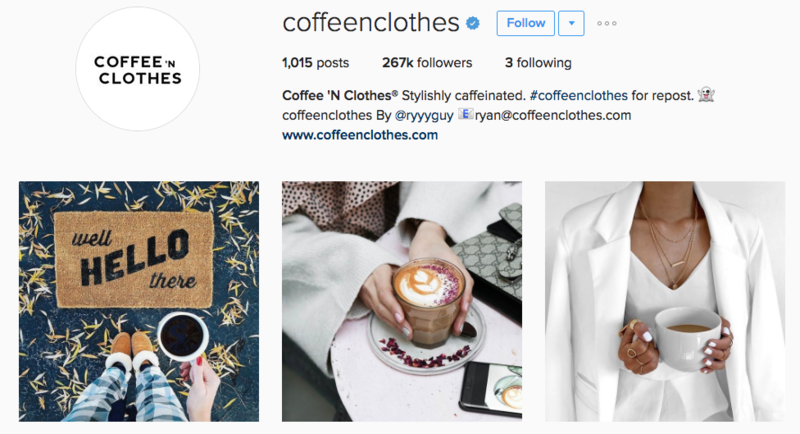 Coffee ‘N Clothes is exactly what you think it is–content including coffee and clothes. This creative instagram feed is for brands looking to increase their visuals and overall brand aesthetic. The simple idea from two photographers highlights the beauty of everyday coffee and clothing. With more than 266,000 followers, this account demonstrates why great photography and content always performs well. The women’s clothing company, Madwell does an amazing job at turning its Instagram feed into an online store. 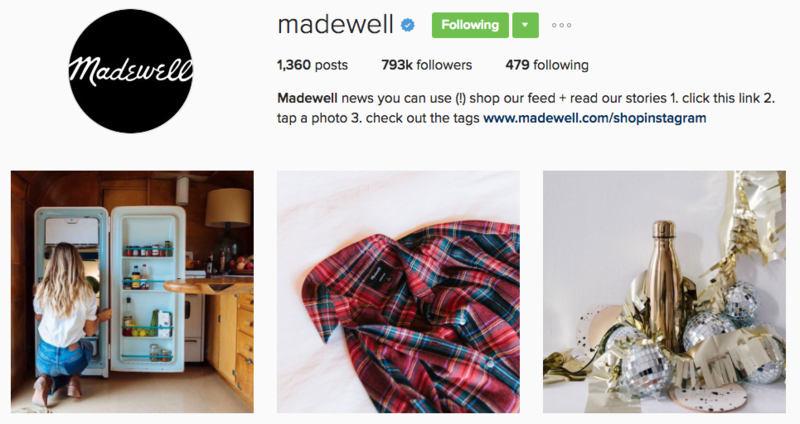 Much like AirBnb, Madewell provides a link to users where they can purchase items mentioned in their Instagram feed. The simple feed uses bright and creamy colors to match its brand. Not only does Madwell showcase great photography, but they’ve obviously created a consistent theme that works. Punch Drink is an online publication providing cocktail recipes, city guides and other related content through its site. 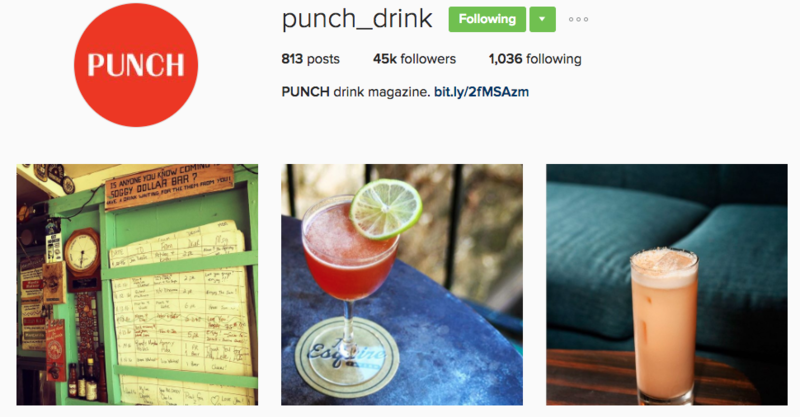 However, on Instagram Punch highlights a different drink in each image. Additionally, Punch has a link in its bio providing the recipe to each cocktail showcased on Instagram. Brands can get a lot of inspiration from Punch through its creative images and vibrant cocktails. They hone in on a niche audience and give them everything they need through great images. The easy-to-use graphic design tool Canva highlights its user-generated content much in the same vein as Adobe. The tool highlights its different features and templates through breath-taking images on Instagram. 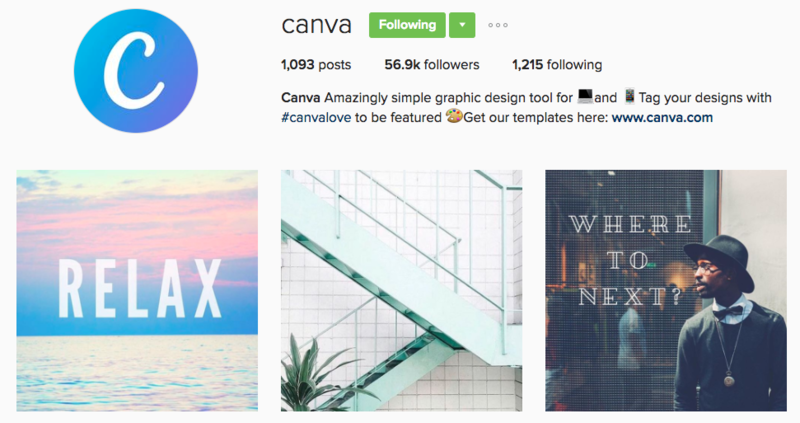 Canva not only makes it beneficial for its users to follow them on Instagram, but they also do a great job showcasing artists in their field. 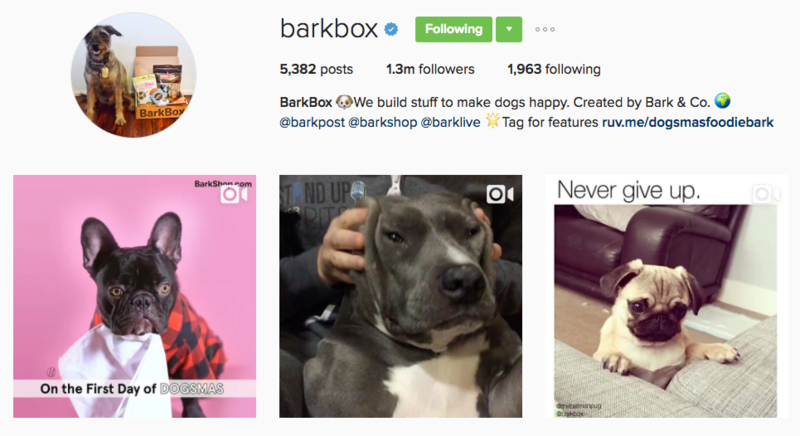 You’ll immediately know why Barkbox has more than 1.3 million followers the second you follow them. The company posts plenty of funny dog content with little promotional images or branding. Instead, Barkbox goes after entertaining its followers first and promoting its brand second. Their feed is very similar to other accounts that only post funny animal content, but instead, they provide discounts and coupons to those who follow them. Brands can be invasive to your personal feed and feel out of place compared to content from friends and family. However, Barbox puts you right at home with plenty of dogs pictures and videos. For the avid DIY home decorator, Apartment Therapy is a great resource of content. The brand wonderfully showcases home improvement and interior design ideas to get followers in a creative mood. Brands constantly look for ways to engage users and providing DIY tips can be extremely successful. Just look at how well BuzzFeed’s Tasty feed is doing. Social media users love seeing how to do projects or make meals on their own. This freelance photographer and aspiring cook posts beautiful images playing on the colors of different foods and objects. 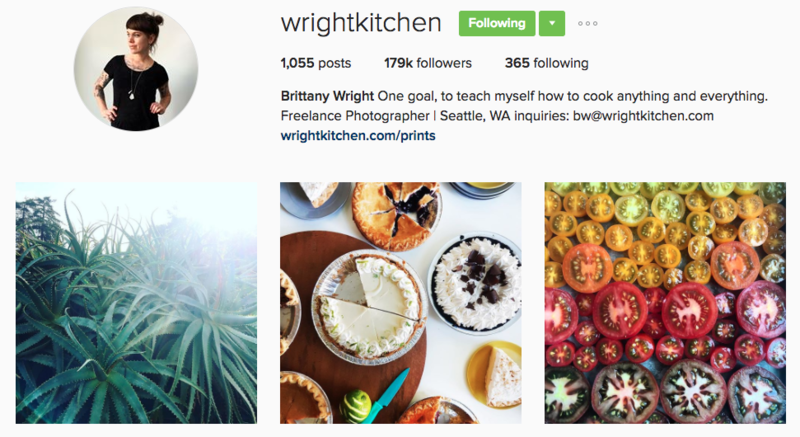 Brands looking for some creative inspiration can easily learn a few things from Wright Kitchen. With 179,000 followers, her fantastic images and culinary works of art get thousands of likes for each post. 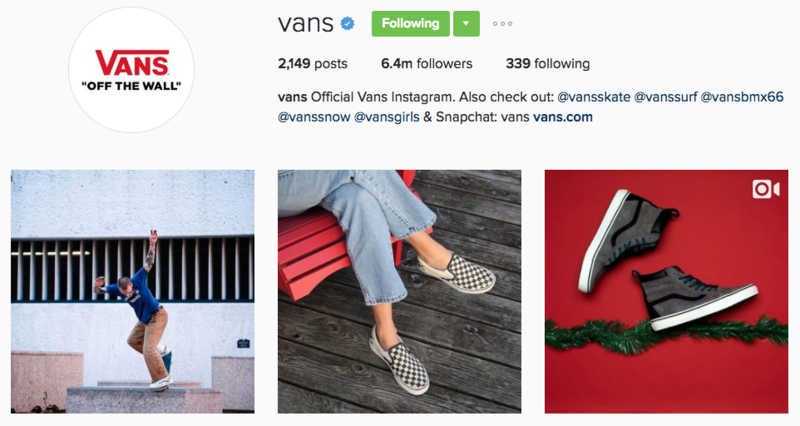 Branding is in the bag for Vans as they continue to increase great content on Instagram. Vans’ aesthetic is impressively artistic, while successfully showcasing its products. While there’s not too much that makes the brand stand out, the Instagram is a constant source for lifestyle and creativity tied to the brand. Each post drives a ton of engagement and the brand successfully engages with users asking questions or making comments. As a little bonus, we’ve included our own Instagram account. Follow us for everything Sprout and our amazing staff here in Chicago. With so much talent on our team, we’re never running out of great posts to share to the world! Who do you think we left out? Comment with your most inspirational Instagram accounts to follow below!